Every year thousands of thoroughbred ex race horses, often referred to as OTTB, (off the track thoroughbreds) retire from the racing industry, their future uncertain. Many well-meaning horse enthusiasts seek to take these horses and retrain them for sport and recreational purposes. This book takes the accumulated experience and knowledge of horse trainer Scott Brodie—manager of the New South Wales Thoroughbred Rehabilitation Trust, re-trainer of hundreds of ex racehorses—and allows the novice trainer to tap into this valuable source of information previously unattainable for the average horse enthusiast. Brodie has a generously empathetic philosophy to handling horses and a unique spin on the retraining of retired racehorses. Utilising a surprisingly smooth synergy of natural horsemanship and the practical application of classical dressage, Brodie’s systematic approach to this often difficult and dangerous endeavour ensures the smoothest and fairest transition for the horse from racing machine to pleasurable riding partner. Without doubt, the most brilliant training book I have ever owned. It gave me a whole new insight into how horses can be trained and learn everything that they need to know from the ground up. Thoroughbred's off the track come with a whole different set of problems than other horses that makes this training so vital. But is also applies to all horses as well. I think this book should be compulsory reading to all horse owners, whether they have off the track horses or not. Scott puts it's all so simply and easy to follow that the horses want to work for you. Cannot recommend this book more highly. The fact that my favourite riding instructor of all time, the amazing Tina Wommelsdorf, is mentioned in the book is not the only reason I have given it a five star rating. Scott Brodie’s boundless knowledge and experience of the re-training of thoroughbred horses shines through from cover to cover. It is also a good read for anyone keen to know how to improve conditions for horses in general on or off the track. The book encourages mindfulness and a sense of fair play and I think it is one of the best go to reads for anyone considering owning a thoroughbred and a valuable reference tool for any horse owner. Fantastic step by step retraining resource. Everyone who owns an OTT TB needs this book. It's easy to read and follow and has been such a huge help to my daughter and I in learnnng to work with her young, green off the track TB. Would highly recommend. 5.0 out of 5 starsInteresting andcUseful. A really interesting and useful book for those tsking on a thoroughbred off the track. 5.0 out of 5 stars"A serious resource and guide for someone considering the difficult task of rehabilitating an ex racehorse". This book is a serious resource and guide for someone considering the difficult task of rehabilitating an ex racehorse. Of course, the sound and straight forward information contained in this book is suitable for any horse and rider that wishes to develop their horse's body and train or retrain their horses mindset (so the horse knows what is expected of them before the rider hops on their back and hopes for the best). 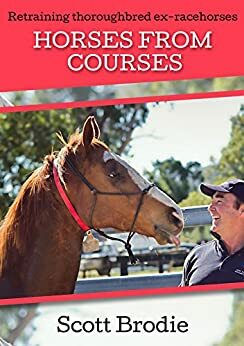 Scott uses a combination of natural horsemanship and classical dressage in his techniques which he shares in this practical, concise, step by step, easy read. This book is made especially entertaining with past tales and experiences from many horses and stories of Scott's colourful and successful career.